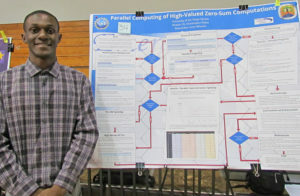 Some of the territory’s budding scientists gathered at the University of the Virgin Islands Friday to display their recent research in the area odf of their recent efforts in Science, Technology, Engineering and Mathematics – S.T.E.M. Projects from the Emerging Caribbean Scientists ranged from dangerous space debris, optimizing aquaculture systems and the effects of anthropophony (human-caused sounds) on the Red-Eyed Coqui frog. The event took place at UVI’s Sports & Fitness Center. “No matter how esoteric these projects may sound, they all have worthwhile goals,” said Lorenzo LaPlace, who is investigating the safety of the island’s cyberspace, a critical topic the world around. Part of the mission of ECS is to “increase interdisciplinary research training” and the presenters interacted with students from every discipline. 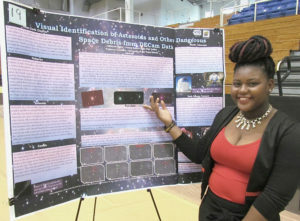 For Lennycia Finley, an Ivanna Eudora Kent student, who at age 15 identifies asteroids and space debris through analysis of telescope data, the contact was much closer. Just a few steps away from her presentation stood Kaheem Walters, who is locating hazardous asteroids, and Harmonie Hanley who presented “Our Falling Sky: A Look At Space Debris. 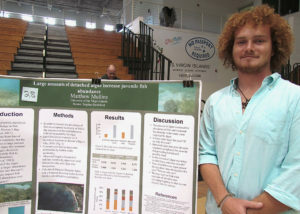 As expected from UVI students, many projects researched the ocean. Matt Mullins studies how a recently introduced algae provides a nourishing habitat for juvenile fish. Brad Arrington dives in Brewers Bay to assess the actions of different species of crustaceans. The symposiums happen regularly across the U.S. and are funded by grants form the National Science Foundation and the National Institute of Health. The next research Symposium at UVI will take place Sept. 22 and, as always, the public is invited. The September event will be judged and winners will be awarded travel expenses to compete at a national symposium stateside.